Absolute Online Estate Auction - Every item must sell, regardless of price. 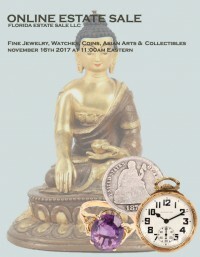 Register & bid now on 475 lots: US Silver & Gold Coins, World Coins, Currency / Paper Money, Gold & Silver Estate Jewelry, Diamonds, Watches & Clocks, Sterling Native American Jewelry, Sterling Silver Flatware & Holloware, Estate Costume Jewelry, Asian / Oriental Furniture, Asian / Japanese / Chinese Arts, Carved Soft Stones, Chinese Carved Jade, Cameras & Photography, Art, Limited Edition Prints, Original Oil Paintings, Hobby, Geodes, Fossils, Books, Stamps, Statuary, Loose Gem Stones, Military Collectibles, Ladies Designer Handbags & Purses, Furniture, Pottery, Glassware, Porcelain, Crystal, Native & Ethnographic Collectibles, Rugs & Carpets, Estate Collectibles. This excellent online estate auction offers a wide assortment of quality estate property - consigned by estates throughout the United States. Online Only Estate Auction. Pre-bidding is Open Now - Register & Start Bidding. 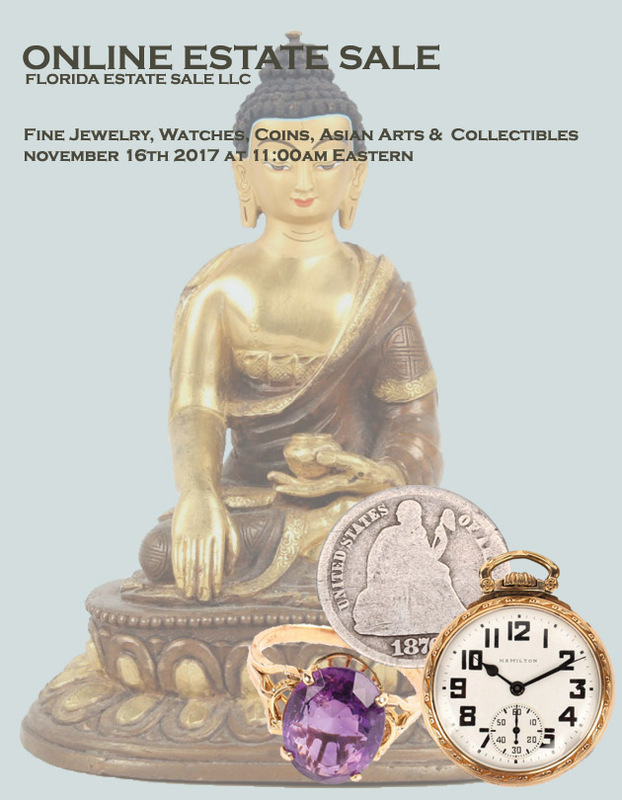 Live Auction Webcast (Live Real-Time Online Bidding) Begins at 11:00am Eastern on November 16th 2017.